Jez: When talking about huge metaphysical subjects, language quickly becomes less precise. It’s easy to describe your hair fairly accurately as being black and curly, but when we start using words like ‘Oneness’, ‘Being’, ’love’ or ‘energy’, meanings become more elastic. What this means practically is that the vocabulary I use in these discussions may have slightly different connotations and meanings for you. In order to communicate clearly it’s necessary to agree on what exactly I mean by the use of such words in the context of this enquiry. Matthew: Would it help, as these sorts of words crop up, if I look up the dictionary definition? Jez: That will be a good starting point, then I’ll apply that definition and refine it so you know exactly what I’m trying to express in the context in which I’m using it. The more we talk about the subjects, the more my interpretation of these words will become clear. Matthew: You’ve suggested that most of our problems come about because of identification with our Personality. So let’s start off with what you mean by the word Personality? Do you mean the ego? Jez: A lot of connotations have become attached to the word ‘ego’, not least the idea that the ego is somehow bad or negative. I use the word ‘Personality’ because it’s more neutral. Matthew: OK, so according to you, what is the Personality? Jez: The Personality is an idea of identity constructed of many aspects such as beliefs, desires and thought; its foundations are laid down in childhood and carried throughout life. We’ll cover all of these aspects individually, but we have to set things up properly before we can do that. Jez: The mind always wants to race ahead, to be anywhere but right here now. 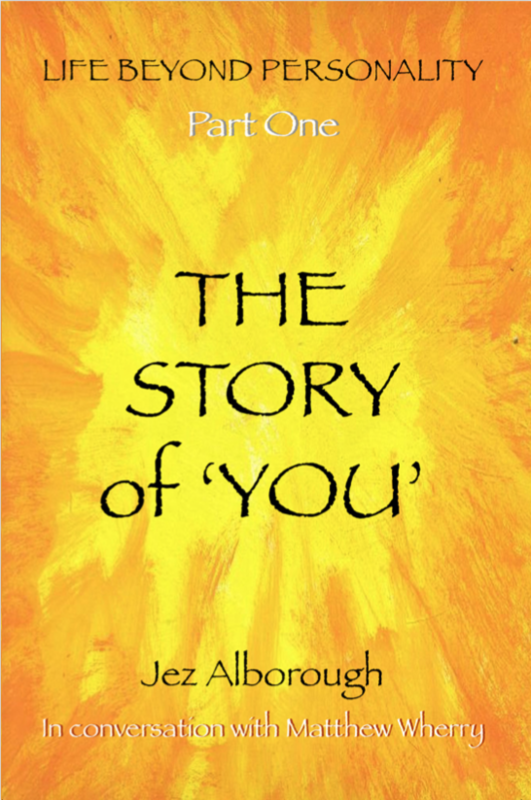 Like I said earlier, what I’m doing here is telling the story of Personality, the story of ‘you’. An epic story such as this has many twists and turns; its overall arc is simple, but the details are intricate. My job is to tell this story as clearly as possible in manageable stages, revealing the plot points in the right order and releasing information at the right time. To make any sense of this story you’ll need to hear it in the order it’s told. If you jump in somewhere in the middle it will create confusion: The story won’t make any sense to you because you won’t have the set-up information you’ll need to be able to follow it. So we have to start by examining what existed before the Personality. That is: Where does the Personality come from? I don’t mean childhood, I mean before that. Matthew: For there to be a Personality there has to be a person. Jez: Right, but let’s keep going back: A person starts out as a baby, but where does the baby come from? I know it sounds like an obvious question, but bear with me. Matthew: You mean the parents? Jez: Yes, the baby is formed from the father’s sperm, which comes from his testes, and the mother’s egg, from her ovaries, her hormones, blood, nutrients etcetera. But if we go back another level, what’s all this biological matter made from? Matthew: Once you start looking under the microscope scientists talk about everything being made of atoms. Jez: Yes, but it doesn’t stop there; they also talk about dark matter, neutrinos and a more general term: energy. It seems the further scientists go into the question of what the universe is made of, the more they discover that they don’t really know. All that happens is they keep inventing names for more stuff they don’t understand. Matthew: So we’ve come to a dead end? Jez: As far as science is concerned, yes, but science isn’t the only approach that man’s mind can make to this question of where we come from. In this enquiry we lean towards a metaphysical approach. So we need to be clear exactly what ‘metaphysics’ is. Matthew: I did a bit of ancient Greek at school. Metaphysics is a combination of two words: Meta, meaning ‘over and beyond’, and Physics, the study of matter and energy. Jez: That’s an accurate description of what we’re getting into: ‘The fundamental nature of Being.’ I’m proposing that our fundamental nature of Being is not this life full of constant thought, emotion and suffering – it’s the Stillness of the Natural State which we come into the is world as. Matthew: OK, so we’re discussing where the baby comes from, in a metaphysical sense, how it comes into Being? Jez: A metaphysical approach would agree with the scientists on the use of one word: ‘Energy’. You can use all sorts of names like atoms, neutrinos and dark matter but an umbrella term for all of that would be ‘energy’. How does the dictionary define energy? Jez: Yes, but there’s another application of that definition, which is that energy is moving from one form, one state to another. Matthew: You mean like water turning into steam? Jez: Yes. That’s energy (matter in the form of water) changing into matter of a different form (steam). But what about energy that hasn’t taken form yet? Jez: At one point, there isn’t a baby; then there is a baby. Matthew: So you’re talking about energy in an unmanifested form? Matthew: I presume this is what it means when you hear the phrase: ‘We are all One’ – they’re talking about the Absolute Level. Jez: Yes, it’s a fairly new concept in mainstream culture. I think it really broke into mankind’s consciousness in the 1950s with the discovery of psychedelic drugs. Following on from this you can find all sorts of oblique references to Oneness in music. Matthew: It’s quite poetic isn’t it? Jez: Definitely. You can see that, as we’re stretching words beyond their capabilities to describe this subject, another form of language is creeping in; a more poetic form. When you’re trying to express the inexpressible, poetry has a magical ability to point more eloquently in the direction of what is being described. The word ‘Oneness’ is quite poetic in a way. It’s not a scientific word, but I think you understand what I mean when I use it. ‘Oneness’ is one of those ‘spiritual’ words that start to make sense if you’ve had any experiences of life beyond Personality. It’s what religiously minded people would call God, but the word ‘Oneness’ is beautifully free of any religious associations. In 1954 Aldous Huxley wrote an essay about a transcendent experience that was stimulated by a mescaline trip. He said that the drug opened up the ‘doors of perception’. (This phrase, previously used by William Blake, is where the band The Doors got their name.) You don’t have to take drugs to glimpse through that door; that viewpoint of Oneness can be available without chemical stimulation. But we’re getting ahead of ourselves. The point here is that when ‘the doors of perception’ are open, we glimpse a different reality; we perceive another level of existence: the Absolute Level. Matthew: People often talk of these kind of experiences as being the outcome of reaching higher level of consciousness. Jez: Yes, I wouldn’t call it higher but it’s certainly different. Consciousness is another one of those big words; we’ll cover it in a later talk. Matthew: When people try to describe psychedelic trips, religious experiences and Openings, you often hear another word: ‘Love’. Jez: Yes, we can’t avoid the ‘L’ word. It’s not a word that most scientists would use but… I’m not a scientist. Matthew: No, but you seem apprehensive about using the word ‘love’. Why is that? We are ashamed of our words. Love is such a big word, it’s come to have all sorts of sentimental meanings; it’s been so devalued there’s a danger that using it in this context will make what I’m saying sound trite. But there’s no substitute for it so I can’t do anything about that; I have to use the word in our vocabulary which, despite its limitations, comes closest to pointing in the direction of this. We’ll talk later about what the word ‘love’ has come to mean in the world of man, but here I’ll make a distinction from that and try to define the way I’m using it in relation to Oneness. Jez: Love, with a capital ‘L’, is what a human feels when they perceive Oneness. The more Oneness is perceived, the more Love is felt. This can’t be proved, but it can be known. Matthew: Oneness is an attractive concept: It sounds so poetic and appealing. Jez: The question is: Is it just an attractive concept that our minds can entertain intellectually, or is it the truth at the core of human experience? A truth that can be known and lived consciously, which has far-reaching outcomes in the life of the knower? Can the wave remember that it’s just a part of the ocean, even as it’s rolling around on the surface looking very impressive and powerful? Matthew: You’re saying that it can. Jez: I am, but we’re getting ahead of the story; we’re still in the set-up. Jez: Yes, but now we’ve discussed Oneness and introduced the subject of the Absolute Level we can start moving towards it. For now, just remember that whenever I use the words Love, Consciousness, or Oneness I’m referring to the Absolute Level.